Co-directed by brothers Arnaud and Jean-Marie Larrieu, '21 Nights With Pattie' ('21 Nuits Avec Pattie') is a puzzling film. Part oddball caper, part whodunit mystery and part journey of self-discovery, it focusses on protagonist Caroline (Isabelle Carré), a woman in search of answers following the death of her estranged mother. Caroline travels to her mother’s home in a remote French village to make the funeral arrangements. 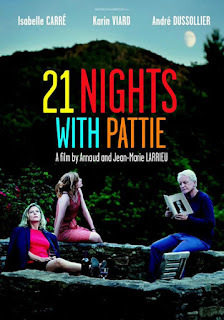 She’s greeted by the titular Pattie (Karin Viard) – a force of nature who tells hilariously filthy anecdotes – and a host of other bizarre provincial characters. Throw in a disappearing body you’ve got a recipe for interesting times. The interactions between Caroline and Pattie are the real high points: Carré’s deadpan bemusement acts as the perfect foil to Viard’s outrageously lewd storytelling. These brilliant comic moments carry the film along and make it an enjoyable watch: it’s just a pity it strays into over-indulgent whimsy towards the end. Newcomer Ondina Quadri makes an impressive debut in 'Arianna', a coming-of-age drama that explores themes of sexual discovery, gender and identity. On the cusp of adulthood, Arianna (Quadri) is preoccupied by her body, and strangely alienated from her peers and the typical teenage experience. A family visit to an old countryside home dredges up half-forgotten memories and leads Arianna into conflict with her evasive parents. As she learns about herself, meets old friends and starts to explore her sexuality, secrets begin to unravel – culminating in a powerful and affecting reveal. Although made on a shoestring (according to director Carlo Lavagna) the film is beautifully shot, making the most of its mountainous Tuscan backdrop and Quadri’s striking gaze. Lavagna handles the under-explored (but important) subject matter with sensitivity and grace and Quadri delivers a raw, compelling performance. Definitely one to watch. Find more info about last minute ticket availability at bfi.org.uk/lff/ticket-availability.